Getting Busy in the Kitchen. I've always had a sweet tooth. Heck, I've even won some very pretty ribbons for my baking. So, finding replacements has been a challenge since eliminating inflammatory foods from my diet. This recipe gets me through when I'm having one of those after dinner hankerings. Wisk all ingredients together in a mug. Microwave for one minute, check for doneness. It might need more time depending on your microwave. Make it more decadent by adding some coconut whipped cream, peanut butter or both! If you know us, you know that we live gluten, rice, and dairy free. Now, this means that we don’t have sandwiches, pasta, or any refined carbs unless it meets the qualifications. I found and adapted this recipe for a loaf of bread when another recipe, Eggs Benedict Casserole, called for bread. I searched the stores first to see if anything was available, but came up short. That lead me to decide to try baking my own, something I haven’t done since I was in high school. I’m amazed at how this turned out. If I didn’t tell you how I made it, you’d never know it was any different from any other homemade multigrain bread. After it was baked and cooled, I sliced the end off of one of the loaves and shared that end piece with the hubs. At first, he didn’t want to eat “just plain bread”. Then his story quickly changed. He said this has amazing flavor all on it’s own. I baked this in 4 mini loaf pans because I didn’t need the entire loaf for the eggs benedict recipe. If using just one pan, make sure to use a metal pan. Instead of using parchment paper in the mini pans, I made sure they were greased very well with coconut oil spray. The loaves came out without any problem what so ever. Be patient with the proofing, it can take longer than you think. If you don’t proof enough, your dough will be heavy, super compact and raw when you bake it. Too long of a proof and you’ll have huge air pockets, your dough will also be dry and less enjoyable. I found that the first proof of 45 minutes with plastic on was enough for the mini loaves and the entire 30 minutes without. This made the bread airy just like you’d get at a deli or bakery. I hope that you’ll enjoy this bread as much as I enjoyed the smells and smiles I got from my hubs. Using a stand mixer with a paddle attachment, combine the dry ingredients. In a small mixing bowl, combine the honey and the hot water. Sprinkle in the yeast and give it a quick stir to combine. Allow to proof for 7 minutes (set a timer!) – NO more, NO less time. Make sure you have the other wet and dry ingredients mixed and ready to go when the 7 minutes are up! 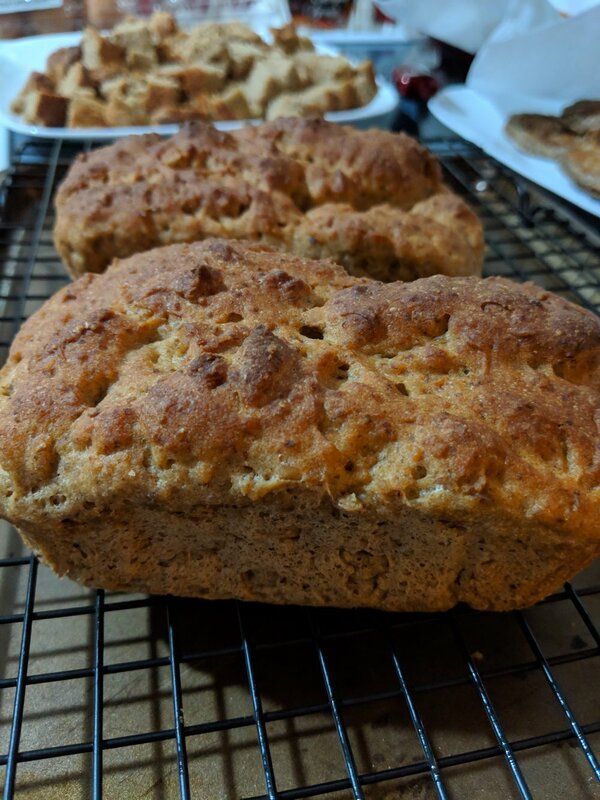 Pour dough into a parchment lined and well greased 9 x 5 metal bread pan or divide evenly between 4 mini loaf pans (the only pan I recommend for this recipe is a metal one, you will not have the same results using other pans). Tap pan on counter several times to even out the dough. Cover with plastic wrap. Allow to rise for 45 minutes to an hour (Check the loaf 30 minutes into rising. When the dough is close to hitting the plastic wrap, remove it; allow the dough to rise the remaining time uncovered.) Keep pan in a warm area, a cooling oven would be fine or on top of the stove as the oven is baking. When the dough is finished rising, bake in a preheated 375 degrees (F) oven for about 30 minutes. If using mini pans, check internal temp at 25 minutes to see if it has reached 190 degrees (F). Most breads are fully cooked once they reach 190 degrees (F). Remove loaf from pan and allow it to cool on a wire rack. Allow the loaf to completely cool before slicing (if you can stand to leave it alone for that long!). Holy cow, this recipe has been made in our house every week since July 2018. My mister raved over how much flavor this has and asked for it over and over so now, I just know that this is one dish we’ll keep on the meal plan each week until he cries mercy and asks for something different. I’ve even taken to teaching him how to make it so that we can spend some quality time together making our food for the week and he builds his kitchen skills should he ever need to cook for me. At first, this one took us a while to make but we’ve gotten it down a science and it can be done in as little as 25 minutes if you’ve got everything ready to go. Just look at all that goodness. Full of veg, protein, and healthy carbs. Before we found out that mister can’t have rice, I even made this with brown rice. So, if you’re not intolerant of rice know that it’s an option if you’ve extra laying around. 1. Rinse chicken and remove any unwanted pieces. Pat dry with paper towel. Place chicken in a bowl and add the rest of the wet rub ingredients. Mix until chicken is well coated in the spice rub. Put bowl covered in the fridge until you're ready to grill the chicken. I've left this in the marinade anywhere from 30 mins to overnight. 2. Grill chicken for about 5-6 minutes on each side, or until chicken is opaque and fully cooked through. If using a grill pan, cover the pan during the cooking process to make sure the chicken cooks through. I like to use a George Foreman grill to make this process even speedier. 3. While chicken is on the grill, prepare the cauliflower rice. Heat a medium skillet with 1 tablespoon olive oil. (The oil is not necessary if you have good non-stick cookware.) Add in cauli rice and the rest of the ingredients and saute for 5-8 minutes, until the cauliflower is cooked through, Take off the head and set aside. Divide evenly between meal prep containers. 4. Once the chicken is cooked through, let cool, dice and place on top of cauli rice in containers. 5. In the same skillet, heat 1 tablespoon extra virgin olive oil. Add in sliced onions and peppers. Saute until onions begin to caramelize, about 8 minutes. Take off heat and add to one side of the meal prep containers. 6. Drain and rinse beans in a mesh colander. Add to one side of the meal prep container. I usually use 2 1/2 spoonfuls to each container. 7. Add chipotle crema ingredients to a small mixing bowl and whisk until well combined. Add on top of the chicken in the containers. 8. Add your salsa or pico de gallo of choice to the bowl. I use 2-3 tablespoons per container. One of the treats we use to enjoy once a month or so was donuts on Saturdays. Since we no longer have that option due to a gluten intolerance, I went on the hunt for some that were gluten free, rice free and dairy free. These win in my book because they are moist and chocolately. If you ask the hubs, it’s a different story since he prefers cinnamon. I always make a double batch to get us through the week and usually eat just 2 at a time. When I went on the hunt, I didn’t even own a donut pan but now I’m super happy with the silicone one I found here. I’ve made these several times and only forgotten the pumpkin once! I will say, you don’t even know it’s in there, but if you forget it the donuts are really dry. So, don’t be like me. Grease a donut baking pan by spraying with oil (I like coconut oil). Make sure the center i coated well so that the donuts won't stick. Place all the dry ingredients in a bowl and whisk to remove all lumps and to combine. I use my Kitchen Aid stand mixer on low with the wisk attached. To the dry ingredients, add the wet ingredients, and mix well to form a batter. Use a spoon to dd the batter to your donut pan to make 5 donuts and spread to smooth. Tap the pan on the counter to smooth out batter and release any air bubbles. Bake for approximately 30 minutes until donuts are set and pull away slightly from the side of the pan. For glaze: melt 1/3 cup of chocolate chips with a table spoon of non dairy creamer of choice and spread over the donuts. Should last a few days in an airtight container. For best results, store in the refrigerator. Don't skip the pumpkin puree! These have a great texture, 6 grams of protein and are right at less than 200 cals each. They also satisfy my sweet tooth after a savory meal. Start by preheating the oven to 375°F then grease a muffin tin or line with silicone liners and set aside. Combine all of the ingredients (adding wet ingredients first, except chocolate chips) in a blender and blend for about 30 seconds, or until a smooth batter forms. Alternately, use an immersion blender. Add the chocolate chips to the blender and gently stir together by hand. *If the batter is warm from blending, allow it to cool first or the chocolate chips will melt. Pour the batter into the muffin tin so that each is approximately 3/4 of the way full. Place them in the oven and cook for 20 minutes, or until light golden brown. Cooking time may vary depending on your oven. Allow to cool for 10-15 minutes then enjoy! Store leftovers in an airtight container for up to 4 days. We store ours in the fridge for up to 7 days. **I use organic creamy peanut butter for this recipe which is all natural but doesn’t require stirring. I would recommend using something similar since using a very runny or oily natural peanut butter may alter the texture. While I’m a huge fan of the double chocolate muffins these are easily my second favorite and my husband’s favorite. I often end up baking both types of muffins for the week because these are so good. Combine all the ingredients in a bowl and whisk until well-blended. I use a mixer or immersion hand blender with the whisk attachment most of the time. Prepare a baking pan with muffin liners. I love the silicone type! For the muffins, combine coconut flour, baking soda, and salt and blend well. Add the eggs, milk, and honey to the dry mixture and blend well by hand, or use a mixer or food processor. Let the batter sit for a few minutes while you make the topping to allow the coconut flour to absorb the moisture. Fill muffin liners about 1/4 of the way with batter. Spoon about a teaspoon or two of topping over each muffin and then top off each muffin with more batter, about 3/4 of the way filled. Drizzle the remaining topping over each muffin and use a toothpick, fork, or spoon to blend the topping into the batter. Be careful not to over mix so that it incorporates into the base batter. Bake for about 24 minutes, or until a toothpick inserted in the center of a muffin comes out clean. Cool and enjoy! Store for a few days at room temperature (covered), seal and store in the refrigerator for a few weeks, or seal and freeze for a few months. I keep ours in fridge as soon as they are cooled from baking. Fluffy, moist, grain free paleo chocolate muffins made with coconut flour! These are incredibly delicious -- no one will be able to tell that they're better for you. Preheat oven to 350 degrees F. Line 12 cup muffin pan with cupcake liners (I love the silicone ones!) and generously spray the inside of each liner with nonstick cooking spray. If using the silicone liners, the spray is NOT necessary. Add almond butter, coconut oil, coconut sugar and vanilla to the bowl of an electric mixer and mix on medium speed until well combined. Slowly add in eggs, one at a time; beat again for one minute until batter is smooth and creamy. Pour in almond milk and mix on low speed until combined. In a small bowl whisk together coconut flour, baking powder and cocoa powder. Slowly add dry ingredients to wet ingredients and mix on low speed until batter is smooth and creamy. Fold in chocolate chips with a wooden spoon. Use a large cookie scoop to disperse batter evenly into prepared pan. Bake for 18-20 minutes or until toothpick comes out clean with a few crumbs attached. Cool for 5 minutes then immediately transfer to a wire rack to finish cooling. If you aren't paleo, feel free to use peanut butter. You can use any nut butter of your choice, just make sure that it is all natural (no oil or sugar added). Instead of coconut sugar, you can use maple syrup. If you do use maple syrup, I would suggest adding a tablespoon or two or of extra coconut flour. When the Mr. and I met, he had never tried Indian food. Needless to say, our second date was at our local Indian restaurant. At that time I hadn't taken the leap to prepare Indian style dishes at home. I've since made lots of different recipes that are Indian style in search of a replica restaurant butter chicken. This one came around not in that searching but just as something new to try. We liked it but decided that it needed a bit less curry so it's not quite as hot. Heat oil in a large pan. Add shallots and cook for 4 minutes. Add squash and sauté for 3-4 minutes. Add coconut milk, broth, garbanzo beans, curry powder, ginger, turmeric, cinnamon, paprika, stevia and salt and pepper. Stir well, then simmer until sauce is reduced by half and squash is fork-tender (about 10-12 minutes). Stir in spinach until just wilted (about 1 minute). Divide rice into ½-cup servings, then pour curry dish on top. Sprinkle cilantro and cashews on top just before serving. *In place of rice, you can serve over cauliflower rice or zoodles. As you might have read before, my Mr. loves BBQ. I even called him the next day when we had the leftovers from this for lunch because my car smelled like BBQ to share the love a little bit more. These can be served on your bread of choice. Since we are gluten free around here now, a good choice would be cloud bread. The next time I make these, they will be served over a sweet potato to switch things up and incorporate a healthier carb. This is another very quick meal for a weeknight dinner. I chopped the veggies and made the sauce before our workout for the day and then threw this together after the workout. To make this a full meal, add some veggies on the side. If you decide to use the sweet potato option, you'd still need to add veggies on the side since the sweet potato is a carbohydrate. In a medium bowl, whisk together all of the sauce ingredients, set aside. Heat a large non-stick skillet to medium heat, then add the peppers, onions and ground turkey. Season lightly with salt and pepper. 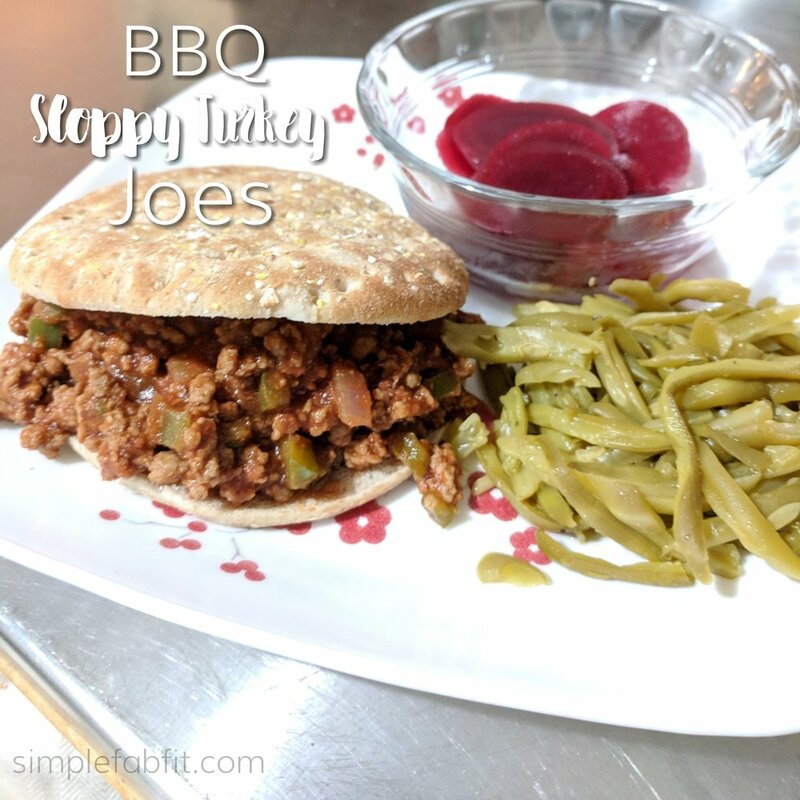 Break up the ground turkey and continue to cook until turkey is cooked through. Stir in the sauce and heat through, check seasoning and add a little salt and/or pepper to taste. Serve with sandwich thins, buns, bread or 1/2 pitas, whatever floats your boat! This would also go well on basic cloud bread. If you’ve never had it and like bread but know you can’t have it, give it a go. Dinner time around house is after workout. Ideally workout would be done by 5:30 but needless to say that's not always the case. This means that by the time dinner is ready, we are hungry bears. To help in this effort, I try to find quick meals for the week nights. I chopped the veggies and chicken and made the ranch seasoning before workout and then all I had to do was basically throw it in the pan, let it cook for 10-15 mins and then eat. So easy. The cheese pictured here is the cheddar variety of Daiya shreds. If you serve this hot and mix it up the cheese melts into gooey yumminess. In a large skillet, heat oil on medium high. Add chicken, onions and ranch seasoning blend. Saute and stir often for 2 minutes. Chicken should not be fully cooked. Stir in bell peppers, zucchini, beans, tomatoes, rice and chicken broth. Bring to a boil, then cover. Simmer on low for 15 minutes or until chicken is no longer pink in the center and quinoa is cooked. Divide among 4 bowls. Sprinkle cheese evenly over. Top with Cilantro and serve! I first saw a version of this recipe in a copy of Cooking Light, I've made it countless times since that first encounter. My Mr. is burger, pizza, and wings eating machine. When we have date night, the popular question is "Where do you want to go?" and the answer I anticipate is usually a burger joint, pizza, or wings. I don't mind going to those places since it is his one night of the week to eat anything he wants. I've also learned how to adapt the menu to what I need to eat to meet my goals. This is a go to when I feel like a cheeseburger but don't want to pay someone else to make it for me or intake unnecessary calories. Another bonus, it's a quick meal for a work night dinner! In our house, I make enough at dinner to eat the leftovers for lunch the next day. It makes it easy meal planning wise and helps keep my stress levels lower since I don't have to spend a few of my hours on Sunday meal prepping all the meals for the week. In a small bowl whisk together mayo, ketchup and water. Set aside. Brown meat until almost fully cooked. Season with salt, pepper, garlic powder and onion powder as you like. Add chopped onion to pan and cook until softened. Divide lettuce, tomatoes, and pickle evenly among 4 bowls. Top with burger mixture and cheese. Drizzle each with dressing. Grab a fork and enjoy. Let's be real, making the transition to eating fully plant based is hard! This meal is 90% vegan if conventional ingredients are used. The only ingredient non vegan is mayonnaise. A vegan mayo can be purchased or made from scratch. I'm phasing out animal products from my fridge currently so what you see pictured is using conventional mayo. I've had a few jars of vegannaise in my fridge and when I use it, I can't tell the difference! To clean celery root, cut the tops off, peel with a vegetable peeler and cut into strips. 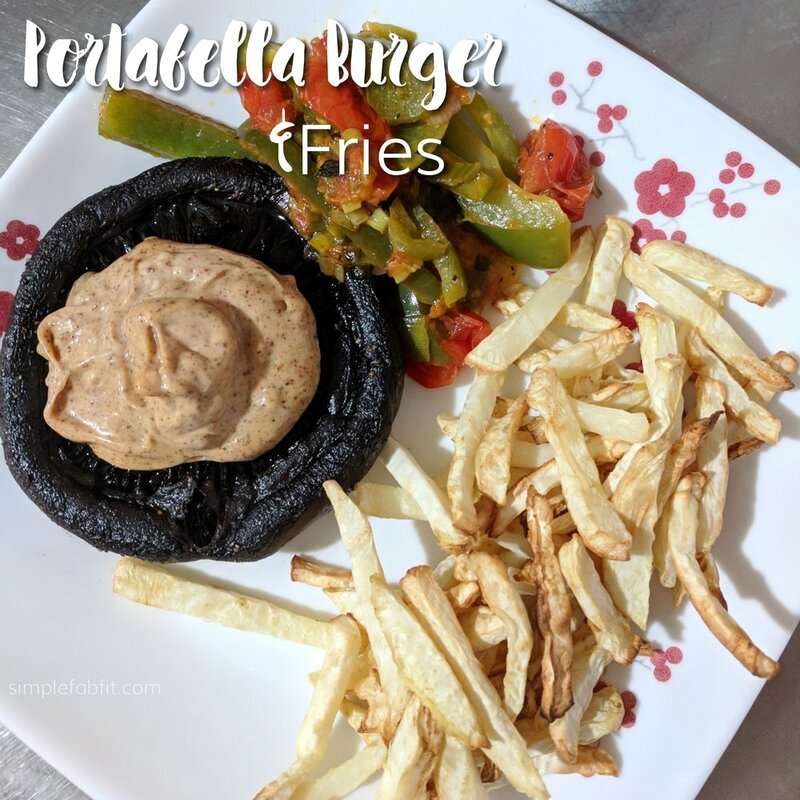 If I close my eyes while I eat the portabella with the sauce, I'd almost swear I was eating a burger! Mix together mayonnaise, chili powder and garlic. Place in the refrigerator while you are preparing the rest of the dish. Remove the stem and fry the mushrooms for 10 minutes on each side until soft and thoroughly cooked. Season with salt and pepper to taste. Fry tomatoes, sliced scallions and chili in a separate pan. Keep vegetables and mushrooms hot while making the fries. Peel the root celery or rutabaga and slice into half-inch rods. Place in ice-cold water for ten minutes. Remove and dry off. TRADITIONAL FRYING: Heat the oil to about 350°F (180°C). Keep your pot or deep fryer under constant supervision. Do not put all the fries in at once, or the oil will cool down.Deep fry until the fries turn golden. Put on paper towels and salt to taste. AIR FRYING: Place enough celery root into basket to cover bottom. Spray with coconut oil spray and toss to coat. Spray again if desired. Set Air Fryer to 400 and switch on for 12-15 mins. Check occasionally for doneness. Growing up, I didn't learn how to cook in cast iron. Since meeting my Mr. I've gained a set of 3 cast iron pans. I've used them a few times and I'm learning with every new recipe I try in them. I've trialed this recipe 2 different ways. Twice using a the cast iron on the stove top and then into the oven and once using a pie plate and oven only. Maybe it's my lack of practice with the cast iron, but I preferred the end result of the pie pan and oven only. If you love your cast iron, go for it! If not try method two below. Both versions are tasty, but since this is crust less, it forms a "crust" of its own with the cast iron that I didn't particularly care for. I'm still going to practice using those skillets anytime a recipe calls for one but this will be made in the oven only from now on for us. Heat a cast-iron, or large skillet over medium. Add avocado oil and pork and brown for 5 minutes, or until cooked through. Remove from pan with a slotted spoon. Add onion to same pan and sauté for 5 minutes or until translucent. Toss in spinach and stir until wilted (about 1 minute). Whisk eggs, milk, garlic powder, nutmeg, salt and pepper in a medium bowl. Add pork back to skillet and spread everything evenly on bottom. Pour eggs on top and let cook without stirring for 5 minutes, or until nearly set. Sprinkle with green onion and feta cheese. Set oven to broil. Add pan to oven on a medium rack and broil for about 4 minutes, or until top is set and cheese becomes golden. Slice into 6 portions, and serve, or cool, then leave leftovers in fridge. Heat a large skillet over medium. Add avocado oil and pork and brown for 5 minutes, or until cooked through. Remove from pan with a slotted spoon. Spray pie plate with coconut oil spray. Add pork, onion, and spinach to bottom of pie plate and spread everything evenly on bottom. Pour egg mixture on top. Sprinkle with green onion and feta cheese. Bake in oven for 30-40 mins. or until top is set and cheese becomes golden. Slice into 6 portions, and serve, or cool, then leave leftovers in fridge. Isn't Pizza one of those foods that just makes you smile? At one point I could put away an entire medium all by myself. Since I've become more conscious of food quality and quantity, I have had to exercise the word NO in regards to pizza more times than I can count. Since the density of nutrients in this recipe are high, it's much more filling than a take-n-bake or delivery pizza. If you find it's not enough, pair it with a side salad full of your favorite fresh veggies. The MR. and I have enjoyed this twice in the past 2 weeks. 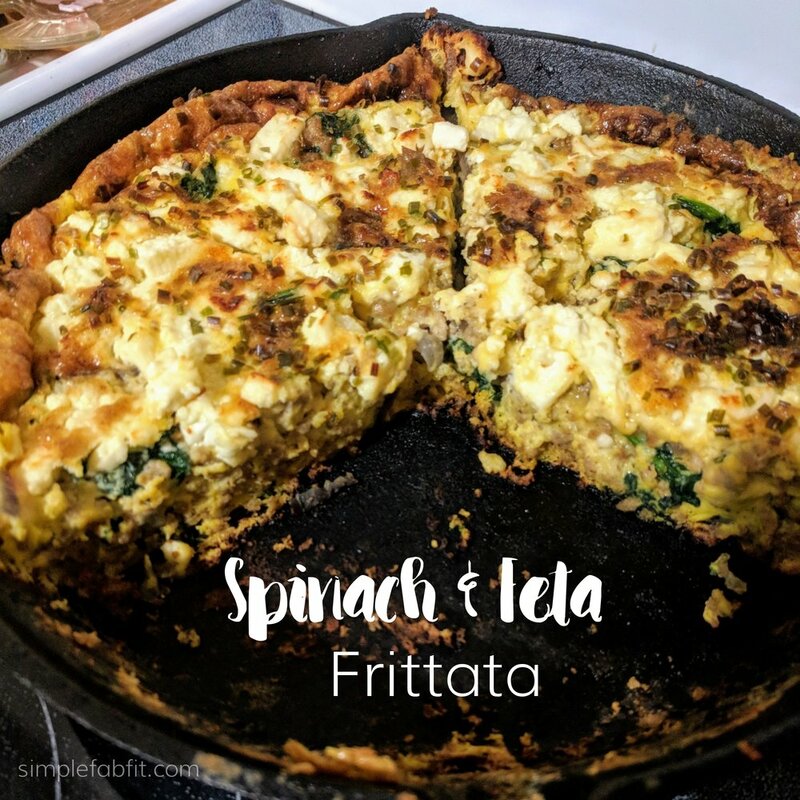 Since I'm on a path to healing my gut, finding foods that make my body happy, and living without inflammation, this recipe has been helpful in keeping pizza cravings away. This makes 8 servings. We each had 2 slices at a meal so, we had it for dinner and then again for lunch the next day. This version uses all ingredients that you can pronounce and isn't overly labor intensive. I whip up the crust, bake it, and pull apart a rotisserie chicken and make the sauce while the crust bakes. Not only does it call for a homemade crust with almond flour as the main ingredient, it also calls for a homemade BBQ sauce. I was surprised by how tasty the BBQ sauce is! The sauce will make enough to create 2 pizzas. Any leftover sauce should be kept in the fridge and used within a week or so. My second batch. I liked this one much better than the first one. Add everything to a small pot over low-medium. Whisk to combine. Once butter is melted, bring to a low boil, then immediately reduce to a simmer for 10 minutes, or until thickened. The yield is about 1 pint, however, if you prefer a thinner BBQ sauce, simply add more water. You should have enough for 2 pizzas. Add ingredients to a large bowl and stir until a dough is formed. If it seems like it needs to firm up, place in freezer for 10 minutes. Coat two pieces of wax paper with cooking spray. Lay dough in center of one and cover with the other. Roll into a circle the size of a large dinner plate with a rolling pin. Flip onto a parchment-lined (or use a silpat) baking sheet. Poke a few holes in the top. Bake for 17 minutes, or until cooked through with the edges starting to turn very light brown. While crust is baking, make sauce and let cook to thicken. Pull apart chicken and remove skin. Using a scale, weigh out 12oz. This works best while chicken is still a little bit warm. The leftover could be reused in a soup or salad. Set aside 3tbs of 1/2c BBQ Sauce. Toss chicken with sauced coat well. Once crust is lightly brown, remove from oven. Turn up oven temp to 400°F. Top with 2-3tbs of BBQ Sauce, use the back of a spoon to spread evenly. Place saucy chicken on top of sauce. Pizza will be packed with chicken. Sprinkle cheese over chicken. Place Slices of onion on top of cheese. Bake for 10-12 minutes until cheese is melted and slightly brown. Top with cilantro and red pepper if desired. Serve. Reese's are one of my all time favorite candy bars. This recipe is as close to one as I've gotten without actually making peanut butter cups or just eating a whole bag of miniatures. Simple, no bake, and even with the added bonus of whole grain oatmeal packed with fiber. Line 8x8 baking pan with parchment or wax paper. In a microwave safe bowl, measure out peanut butter and honey. Microwave in 20 second intervals, stirring between, until fragrant and slightly bubbly. Stir oatmeal into peanut butter and honey mixture until all combined. Press peanut butter and oat mixture into pan using a piece of wax paper. Using the double boiler method, melt chips (or pb and chips) until smooth. Pour topping over oat mixture in pan and evenly distribute. Place into fridge for 30 minutes to firm up. Cut into 16 squares, remove from pan, and devour. I often have the urge to head out the door to my favorite Mexican restaurant, but unfortunately my Mr. isn't a big fan. Not sure why because he's quick to eat anything Mexican inspired that I cook. So I often make up for lack of restaurant access by cooking tex-mex dishes for our lunches and dinners. In the past, I've made lots of slow cooker type recipes that are delicious. You can even find many of them here on the website. This time around, I threw together a plant based taco lasagna. As per my norm, I was tasting as I cooked to make sure it would have the right flavors and the right amount. It started out a little bland so I doctored it up right away and came out with a dish that is pretty tasty. 1. Boil 1 1/2 cup of water in microwave. Add cashews and let sit for at least 15 minutes while you prepare the rest of the items. 2. Preheat oven to 390°F. 3a. Wash peppers and tomatoes. Add to foil lined baking sheet. Roast peppers and tomatoes for 45 minutes. 3b. If you have an air fryer, you can speed this process up by placing peppers and tomatoes in the basket, turning air fryer to 390, and roasting for 10 -15 minutes. Be sure to check in on them after a few minutes. 4. Open and drain black beans. Mix together with chopped garlic. Set aside. 5. Heat a pan over medium heat, add 1 tbsp olive oil. Once oil is hot, add chopped onion and crumbled tempeh. Cook for 7-10 minutes or until tempeh is slightly brown. 6. Once vegetable are cooked, remove from oven or air fryer and let cool for 5-10 minutes (until you can handle them). Remove the skins and innards from the peppers. Add along with tomatoes to a blender or food processor. You could also add some Cayenne pepper but we don't like a lot of heat. 8. Mix sauce with onion and tempeh mixture in pan. Allow to cook on low until you finish making the cheese sauce. 9. Cheese sauce: Drain soaking cashews, add to blender with tahini paste and vegetable stock. Taste for flavor and add salt, pepper, or other seasonings as needed. 10. Assemble the lasagna starting with a thin layer of cheese sauce, then tortilla, tempeh mixture, beans and then cheese sauce again. Finish with a later of tortillas topped with cheese sauce. 11. Bake at 360°F for 25-30 minutes. Serve and enjoy! I spend a good chunk of my Sunday in the kitchen running a cooking marathon. These little guys were the result of the most recent success. I received an Air Fryer as a gift from my Mr. a few months back and put it to the test as often as I can. The original recipe I found called to make these in the oven but using the air fryer cut the cooking time down significantly and allowed me to use the oven for several batches of apple chips. I can also imagine making these for a pitch-in or party. Simple ingredients, plant based, and flavorful. 1. If using the oven, preheat to 400° F. If using Air Fryer, make sure your basket is clean and preheat if you'd like. It's not necessary. 3. Using a small cookie scoop, scoop onto plate or parchment lined baking tray (if baking in oven). 4. Smooth out balls between your hands gently. 5. If baking, bake for 30 minutes. If air frying, gently place into basket, turn temp to 400 and allow to cook for 10-12 minutes. 6. Allow to cool for a few minutes before serving with a side of pizza sauce for dunking. We are often on the look out for low carb options especially when it tastes like our favorite foods! This pizza was easy to make and was highly approved by both the Mr. and I. Pizza is a food that I use to eat by the box full and seems to be ever present at social gatherings. While I love it as much as anyone can, I have had to say no on more occasions than I'd like because I have goals to meet. If you're pushing towards those goals, those extra calories from refined carbohydrates aren't helping you get there. This eggy pizza crust is easy to make and can be topped with your sauce, veggies, meats, and cheese of choice. This is by far a treat due to the eggs and cheese content. Preheat oven to 400°F. Line baking sheet with parchment paper and set aside. Pour into lined baking sheet. Bake for 15 minutes or until golden brown. Remove from oven. Increase oven temp to 450°F. Top with sauce, toppings of choice and cheese. Return to oven for 5-10 minutes, until cheese is bubbly and slightly golden brown. Cut into serving sizes and eat! 1. Preheat oven to 400. Line baking sheet with foil or parchment paper. 2. In a large bowl, place all of the meatball ingredients and mix well using your hands. 3. Form into meatballs just a little bit bigger than a golf ball and place onto baking sheet. I use a cookie scoop to make meatballs uniform. 4. Bake for 25 minutes. Makes 24 meatballs. While the meatballs are cooking prepare the sauce! 1. In a large skillet saute the garlic in the coconut oil over medium heat for 2-3 minutes. 2. Add the honey, curry powder, and tomato paste and whisk together. 3. Add the chicken broth and continue to whisk until the sauce is smooth. Energy balls are my jam! I'm a little bit obsessed about them. I've made 4 types in the past 4 weeks and I'm sure I'll be making more varieties in the following weeks. These are just as amazing as the others I've made recently. Measure out all ingredients into a big bowl. Stir like crazy to combine. Using a cookie scoop, scoop out 12 portions onto parchment paper lined cookie sheet. Using wet hands, compact and smooth out balls. Refrigerate for at least 1 hour to firm. We usually pack 2 in our lunches as an afternoon snack. With the meal planning I do, this lasts us for 3 days.